Decorating the Christmas tree is one of our family’s favorite holiday activities. We crank the Christmas music up loud and truly make it a team effort with Dad in charge of the lights and the girls trimming the tree in everything shiny and bright. It’s exciting to pull out all the ornaments and reminisce on times when one was purchased or created. Some of the most treasured ornaments on the tree are those that were handmade. 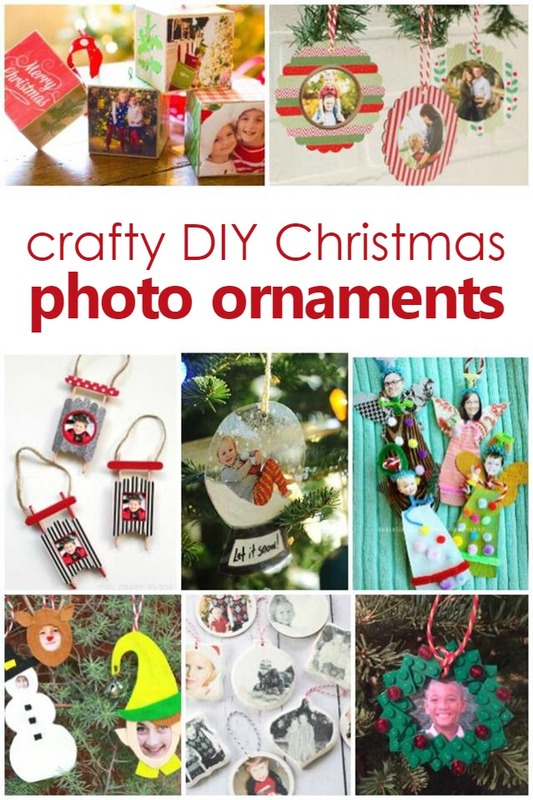 Christmas photo ornament crafts are especially one of my favorites as they have a magical way of freezing time. My girls love seeing older pictures of themselves on the tree and it usually prompts a request to create more! 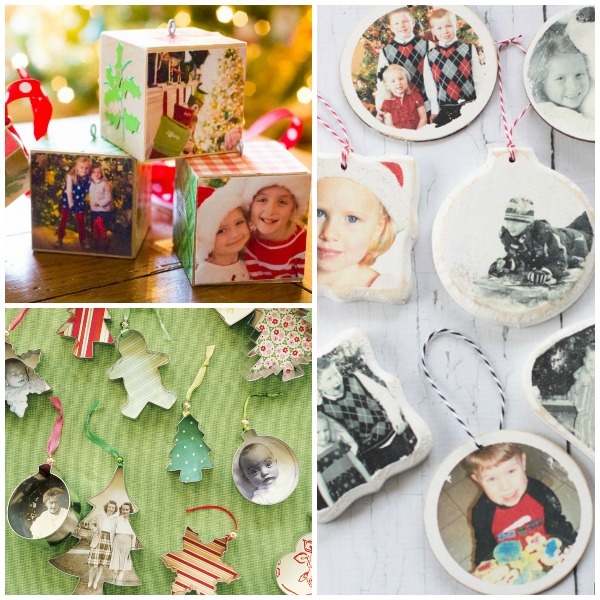 If you’re looking for some fun ways to don your tree with a memory that you’ll cherish forever, check out some of these photo ornament crafts. 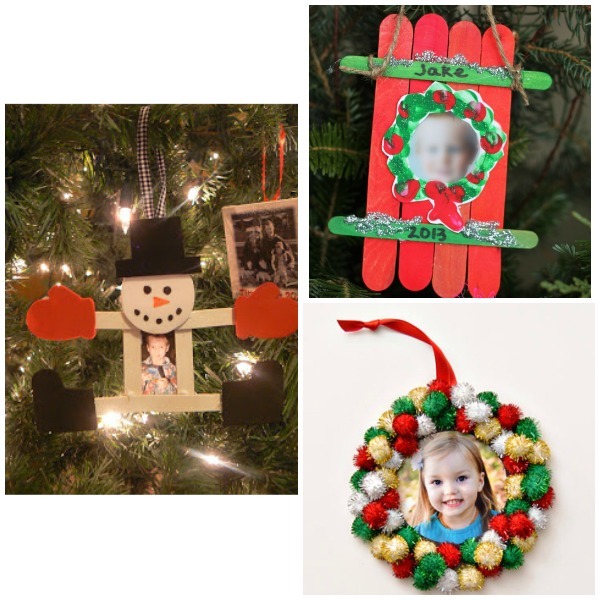 We have found some of the very best that are sure to make you smile every time you hang them on your tree! 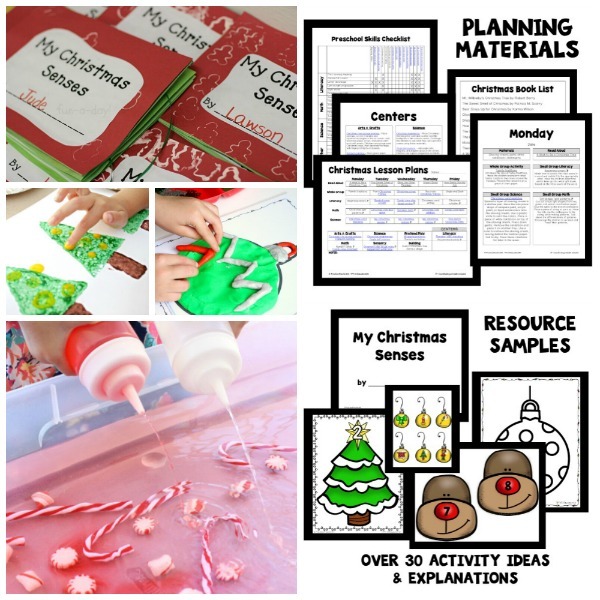 There are some ornaments that your kids can help create and others that may require adult hands only. Your Lego fans will love helping you frame their picture with this Lego wreath ornament by Honey and Lime. 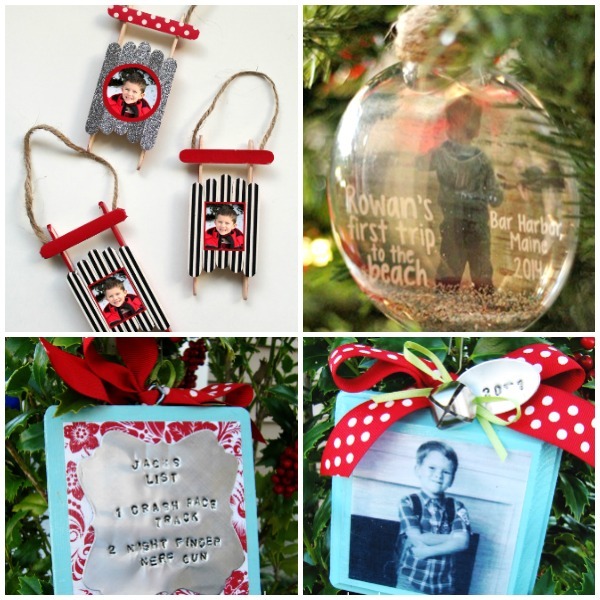 These colorful photo ornaments made from washi tape by No Biggie are sure to add some flare to your Christmas tree. Teach Me Mommy has an adorable way to save your little one’s handprint and picture by making a keepsake hand print ornament. Grab some scrapbook paper and transform your family into angels like Thompson Family did with this family of angels ornaments (Site no longer active. See bottom right corner for inspiration). Make a snowman Christmas ornament out of popsicle sticks and craft foam by Mrs. T’s First Grade class. A template for the snowman’s accessories is included. Create a personalized sled craft picture ornament from Things to Share and Remember. We especially adore the fingerprint wreath! This wreath ornament made with pom-poms from She Knows makes for a festive way to frame your favorite photo. We love this 3-dimensional sled ornament made with washi tape and popsicle sticks by The Craft Patch Blog. Where the Smiles Have been has a fantastic way to commemorate your baby’s first beach trip by adding a little sand from the beach to it. Capture your child’s photo and Christmas wish list with this metal stamped Christmas ornament by Positively Splendid. Display some of your favorite photos using this wooden block ornament tutorial from Peanut Blossom. 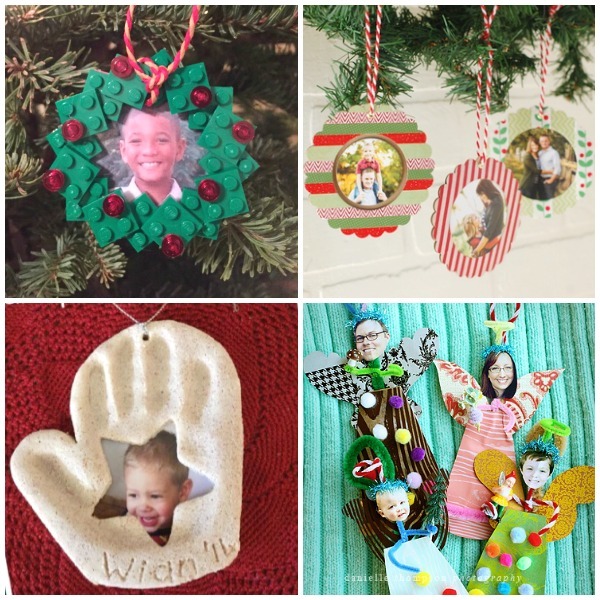 Landeelu has a fun photo ornament tutorial that will take your favorite photos to another level of beautiful as they are displayed on wooden ornaments on your tree. Leave it to Martha Stewart to turn some cookie cutters into photo ornaments faster than you can bake a batch of cookies! 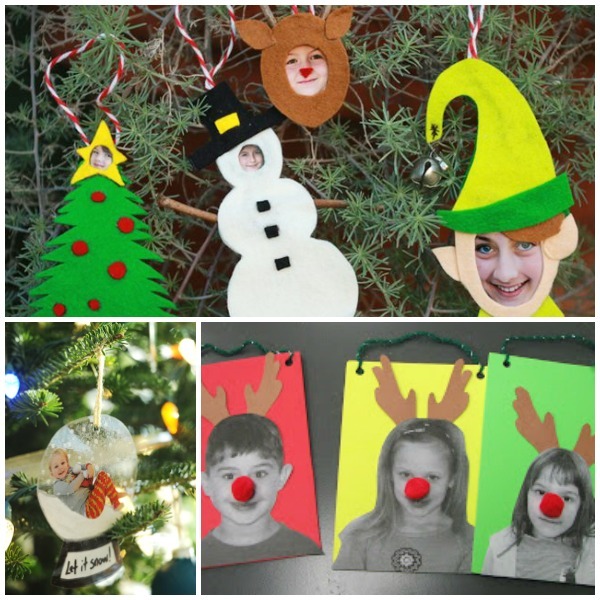 These cute photo ornaments inspired by Jib-Jab from eHow will have you laughing all the way! Grab a laminating pouch and some permanent markers to make these easy snow globe photo ornaments from Rust and Sunshine. Hang a cute little reindeer on your tree this year with this Rudolph the Red Nosed Reindeer photo ornament from Timmons Times.